Our last update was over a month ago (4/11/18). You can find that here: https://wp.me/p6gPya-1Uh. That was written on April 11 while Emily was enjoying a couple of weeks off before her next methotrexate chemo treatment. That was supposed to start on April 24 (we started one day late), but since then, nothing has gone according to plan. I will give a brief update and for those that just want pictures, I have plenty of those at the bottom. First, the good news… It has been great to have a lot of family visit us over the last month. Ali and her boyfriend (now fiance) visited for a few days. My sister, Mary, came back for about a week to help during a chemo round. My mom came for a week, and now Sue’s parents are with us for about a month. Having family to support and help – especially when I am traveling – is very encouraging and uplifting. We are very thankful (pictures later). We went in for Emily’s 8th week of chemo (out of 18) on April 25. That was a methotrexate week. She’s had four of these in the past. Typically, she has been in the hospital for five nights. The first two and a half days are rough, but the last two and a half days are usually just waiting for the drug to get flushed out of her system. They test her every day to see when it gets low enough in her system, then they send her home. They need to get the methotrexate out of her system because it can damage your liver and kidneys. Typically, she would have numbers low enough (of methotrexate in her blood) that she could come home on Monday. But the number didn’t go down at the same speed as past treatments. Also, some of her other numbers were lower than they should be, so she needed another blood transfusion. 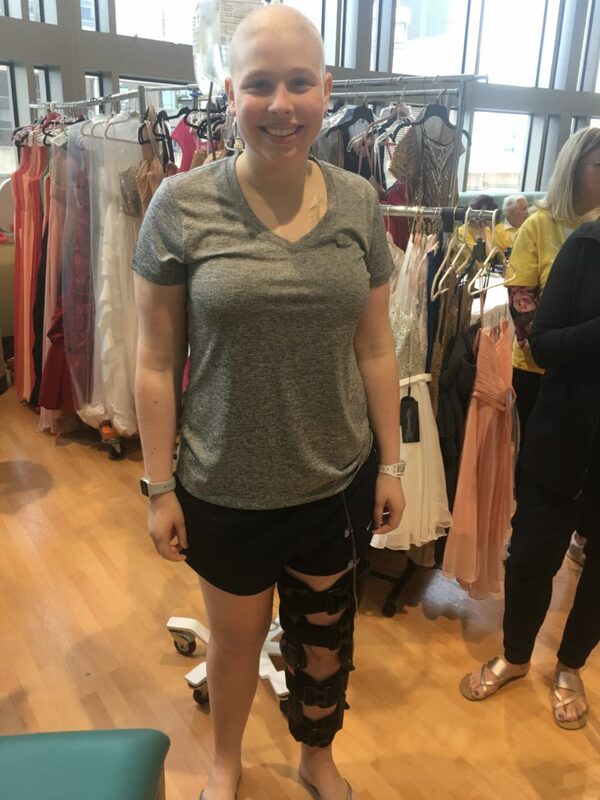 Starting on day 8 – they began to send Emily home every night connected to her port – with a backpack full of fluids – to keep trying to wash the methotrexate out. 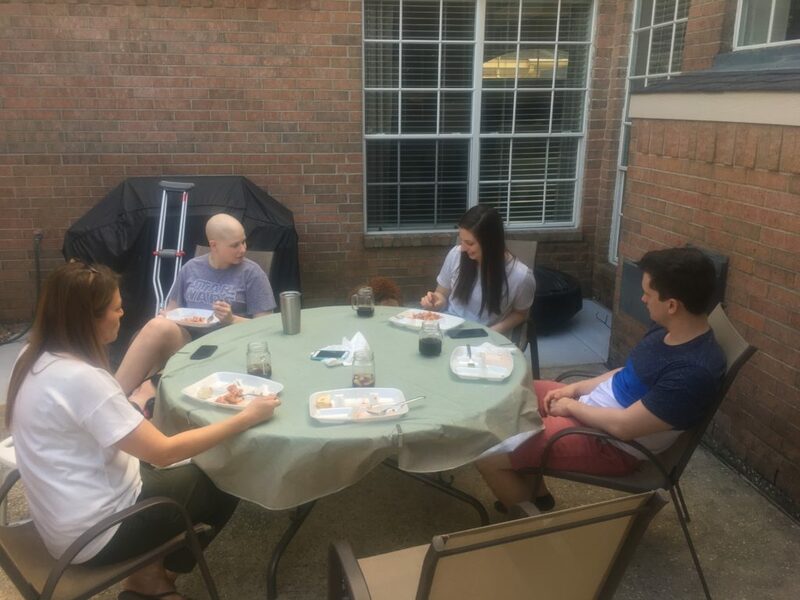 So each morning, Sue and Emily would go to the hospital at 8:30 AM, receive fluids all day, and come home around 6:30 PM with a backpack full of fluids. Then she would go back the next day. 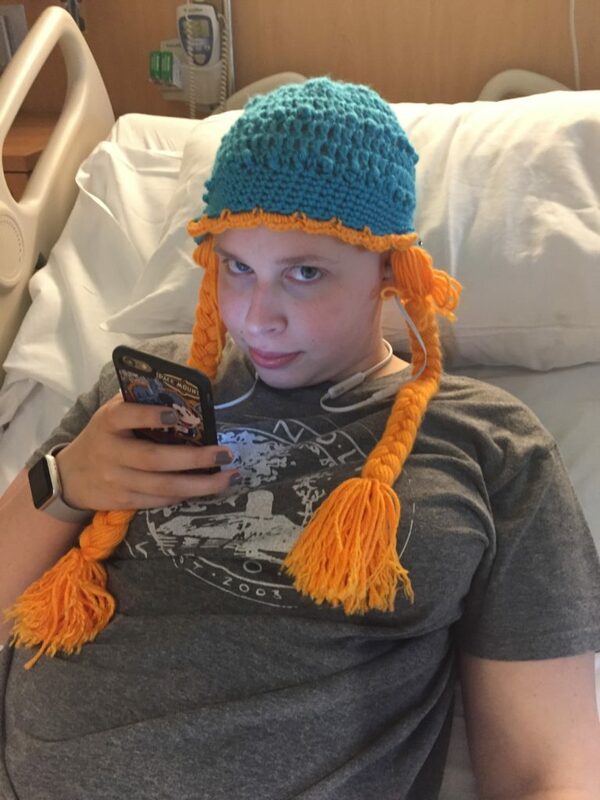 Finally, by Saturday (10 days in) the methotrexate number was low enough, they unconnected her port and sent her home. The goal was to start week #9 of chemo on Tuesday (a week later than planned). But they tested to be sure the methotrexate was out of here system, and it wasn’t. So we waited all week. Three days last week, Emily’s blood was tested and each time the methotrexate was still in her blood, and the oncologist doesn’t know why. They have her drinking over a gallon of water every day. So it is now almost three weeks after her treatment and, as of Friday, it still hasn’t left her system. We are getting a bit discouraged because she has fallen two more weeks behind schedule, and if this is how her body is going to handle methotrexate, it will take months longer than planned to finish her treatments. Tomorrow morning (Monday, May 14th), she will get tested again, and if the methotrexate number is .03 or less, they will let her start another treatment on Tuesday. If not, I’m not sure what the plan is. She is scheduled to have seven more methotrexate treatments. 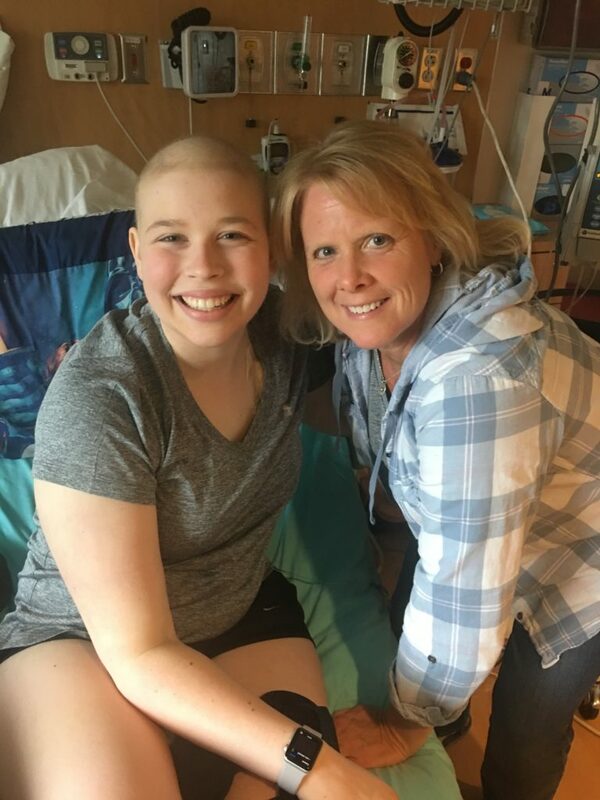 If her body continues to take three weeks or more to eliminate the chemo from her body, it would extend her treatments through the end of the year. They are indicating that isn’t an option they want to try, so we all anxiously await the results of tomorrow’s blood test. 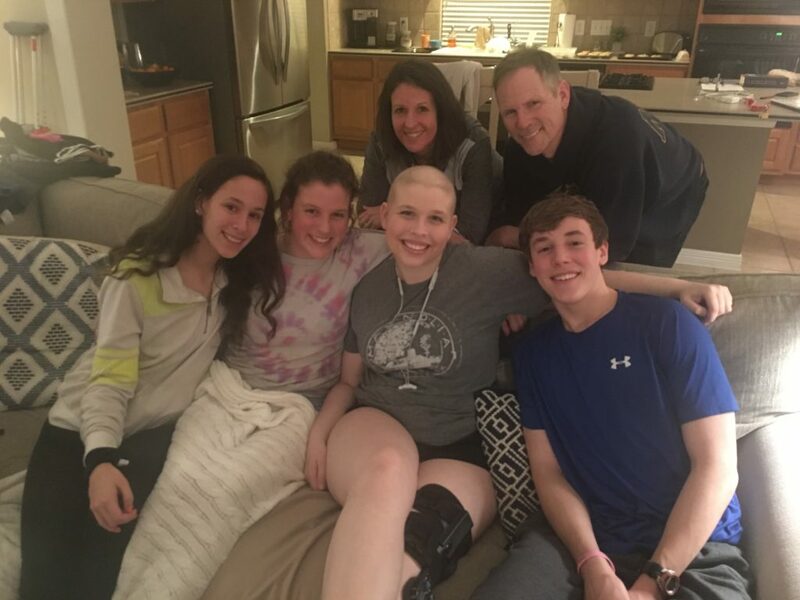 We are thankful that Emily feels so well between treatments. So although she is discouraged because she wants to get her treatments going, it is nice that she feels well and is able to enjoy life. We are thankful that family has been able to come and visit. I’m back to a normal travel schedule with my job, so I get more stressed when I’m not in town. So knowing someone is here to help and support Sue is very encouraging. Especially if some bad news comes along. Today is Mother’s Day and I’m so thankful for Sue. It has been said that the person most “forgotten” during a disease battle is the primary caretaker. And Sue, who always has quietly served her family, has been a champion. I think there is only one night through all of this that she didn’t sleep in the hospital with Emily. And those who have stayed all night in a hospital know what that is like. She is on a couch with nurses coming in hourly, asking questions, changing meds, taking vitals. 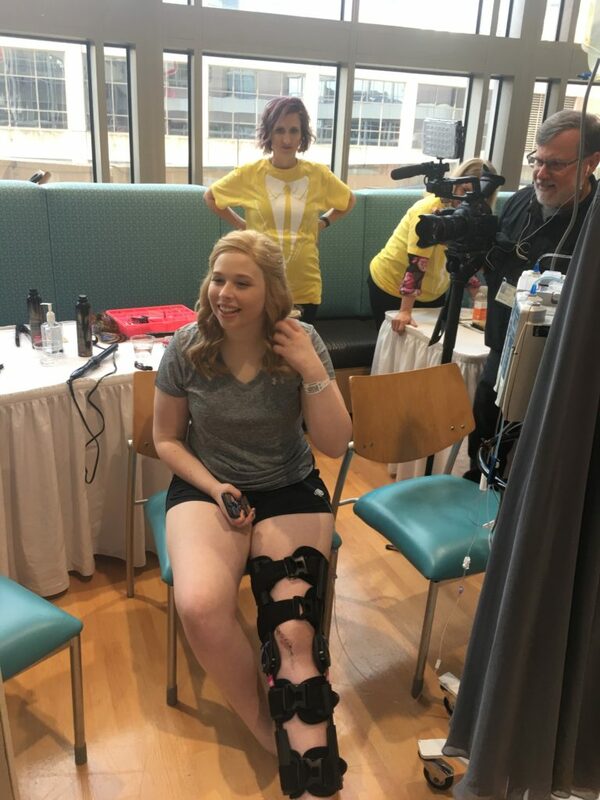 And Emily wakes up every couple of hours to get rid of the fluids that have been accumulating in her body, and because of her knee – needs help getting to the bathroom in time. So, there is no such thing as “a good night of sleep” in the hospital. We are thankful for an organization that grants young adults “wishes” (different than “Make a Wish” foundation). 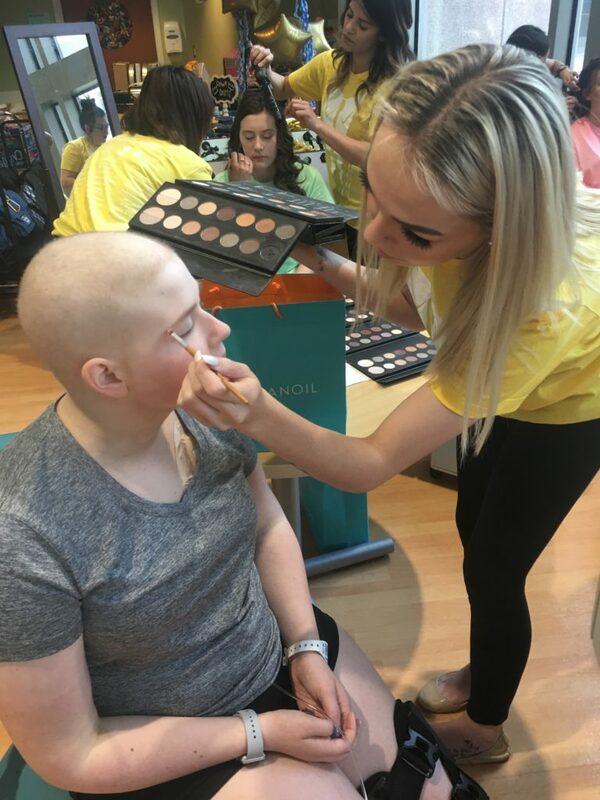 “Make a Wish” Foundation is for those who are diagnosed before their 19th birthday. 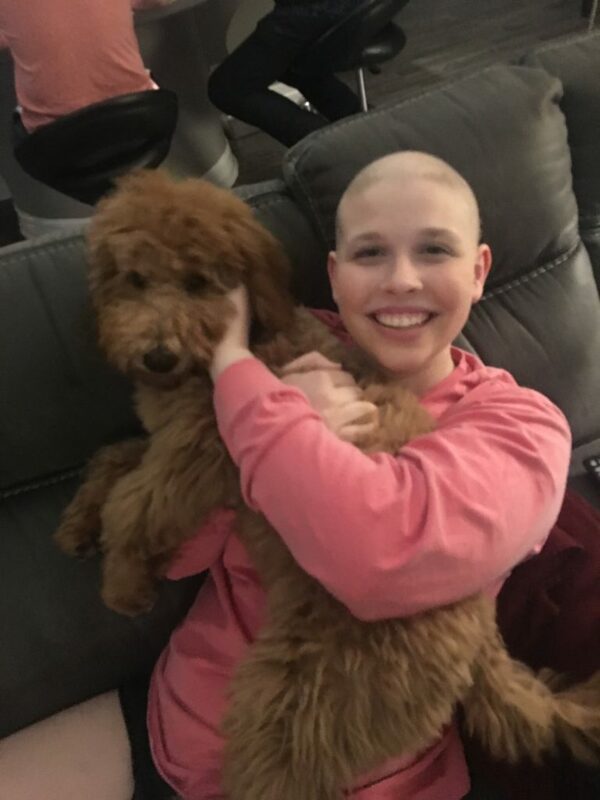 Emily was diagnosed almost exactly three months after her 19th birthday, so she couldn’t participate in a “Make a Wish.” But a social worker told us about an organization (Dear Jack Foundation) that grants 3 wishes (up to $2000) for young adult cancer patients. With all that Emily is suffering through, I’m so thankful for small and large blessings to encourage her along the way. She made her 3 wishes and she already has received two of them! She now has an Apple Watch and an iPhone X! Her final wish is for the three of us to go see Les Miserables when it comes to Houston this fall. So we are looking forward to that. Pray that tomorrow, Emily’s number would be low enough that she could start another methotrexate treatment on Tuesday. Pray that Emily would be able to walk without a limp within six months from surgery (mid-September). It will require hard work and good enough health to be able to work hard. Pray that the methotrexate elimination was a unique situation and it won’t happen again. 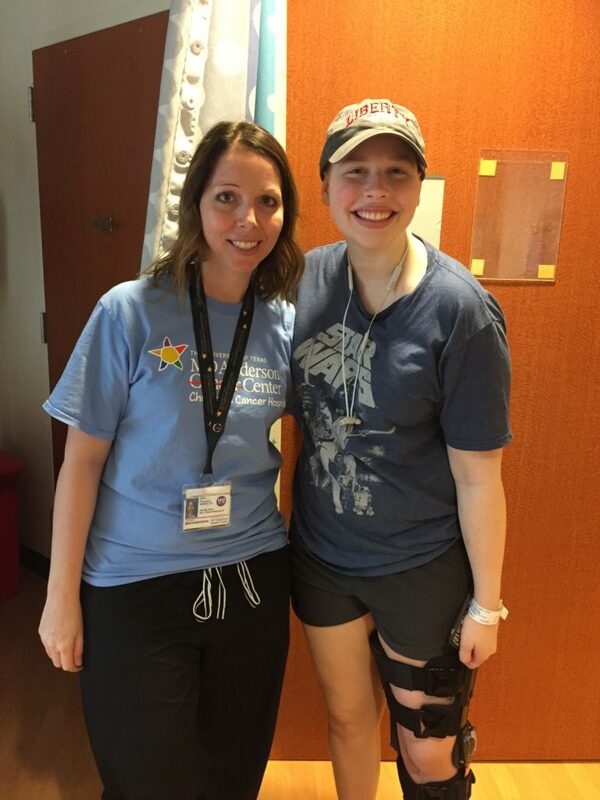 She would love to start the next treatment a week from Tuesday (May 22). A few updates ago, I mentioned Thomas, a young boy who was suffering from osteosarcoma that had spread through his body. Pray for his family as his body recently succumbed to the cancer, and he passed away. I have been praying Psalm 31:24 for Emily recently. It says, “Be strong and take heart, all you who hope in the Lord.” I’m praying that Emily will be strong, take heart and continue to put her hope in the Lord. Will you join me in praying that for her? 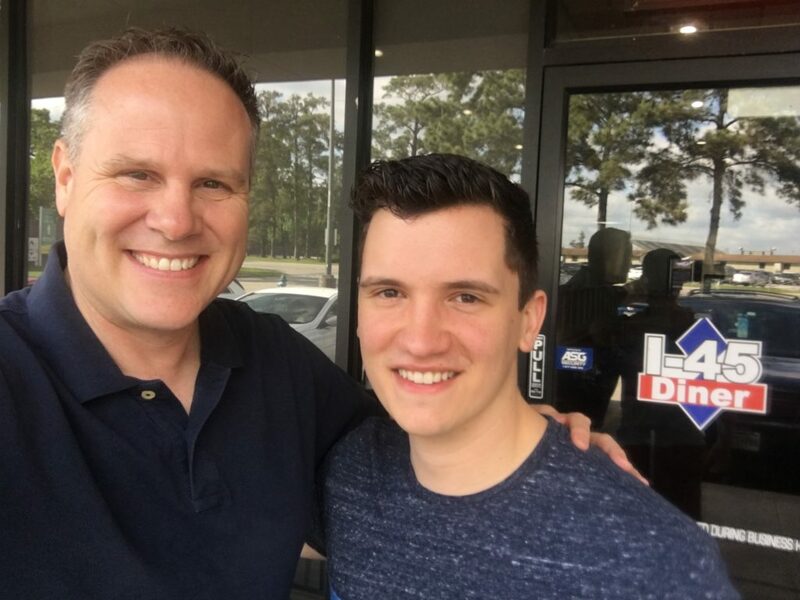 While Ali & Justin were visiting us, he asked me to go to breakfast. While there, he asked my permission to ask Ali to marry him. After a couple hours of grilling him, I joyfully said, “yes.” We are thankful for Justin! 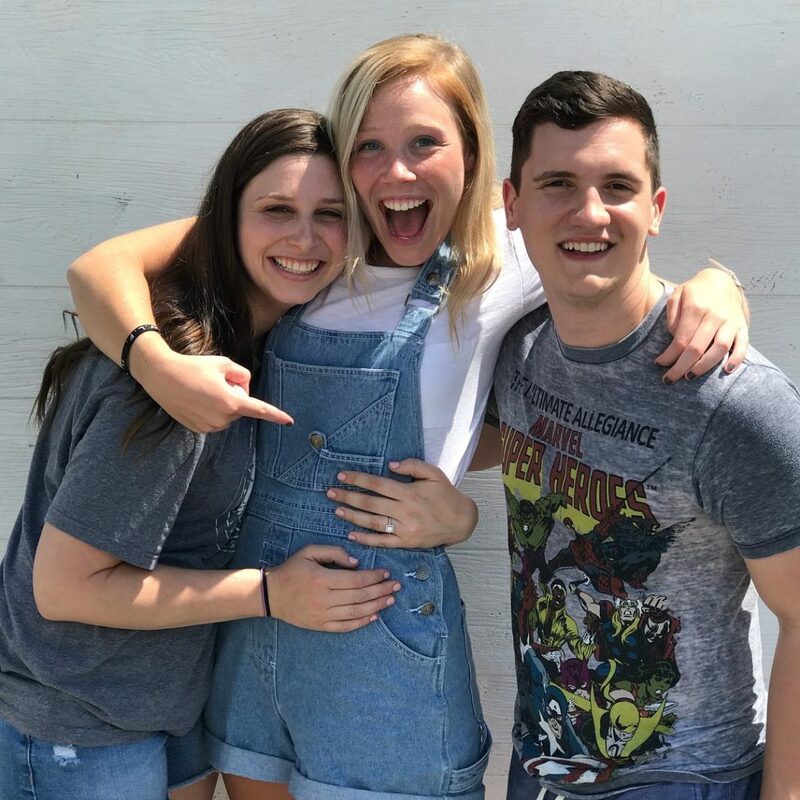 Two years ago when Justin was an intern at Northridge, I remember Sue telling our girls, “One of you needs to marry that boy!” I’m still not sure who likes Justin more – Ali or Sue. 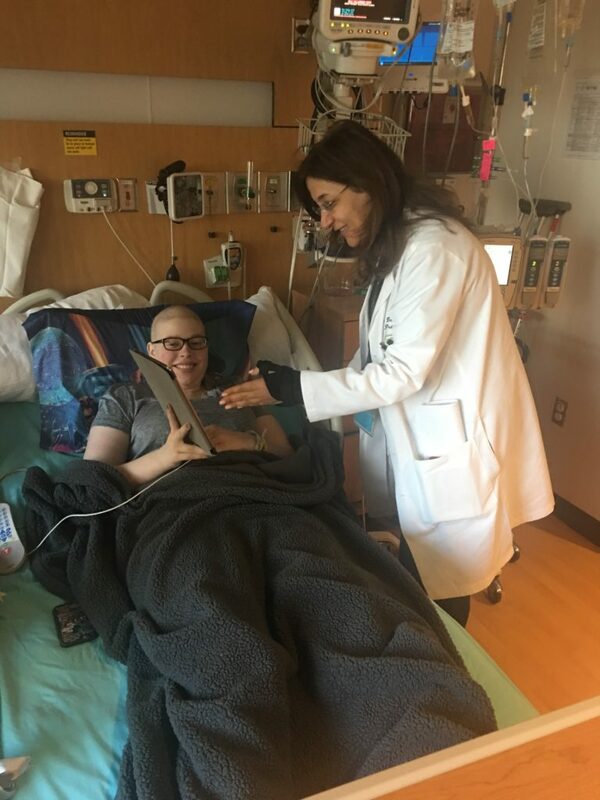 Having Ali and Justin here during a chemo break was a great blessing for Emily. Ali had talked to us about a wedding, but never in front of Justin. Once they talked together about getting married, Emily kicked us off the patio so she could ask Justin some questions. 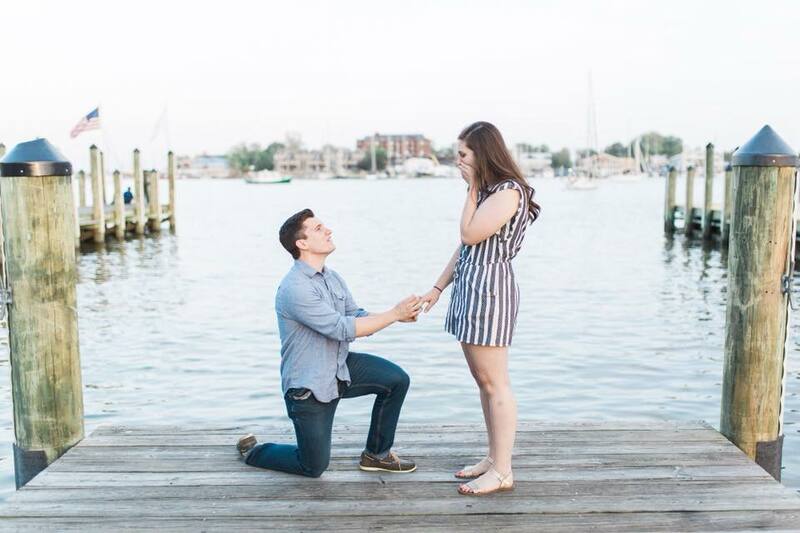 She had a lot of good questions for him, but the final one was, “Will you tell me when you are going to ask her?” He promised to let her know ahead of time. A couple weeks later, one evening, Emily got a text from Justin that simply said, “Game Time!” and we knew what was coming. … a stop at Liberty to see her sister, Morgan. My brother’s family drove through Houston on the way to a cruise and were able to spend about three days with us during Emily’s break. It was great to see them. We ended their visit with their family praying for Emily. 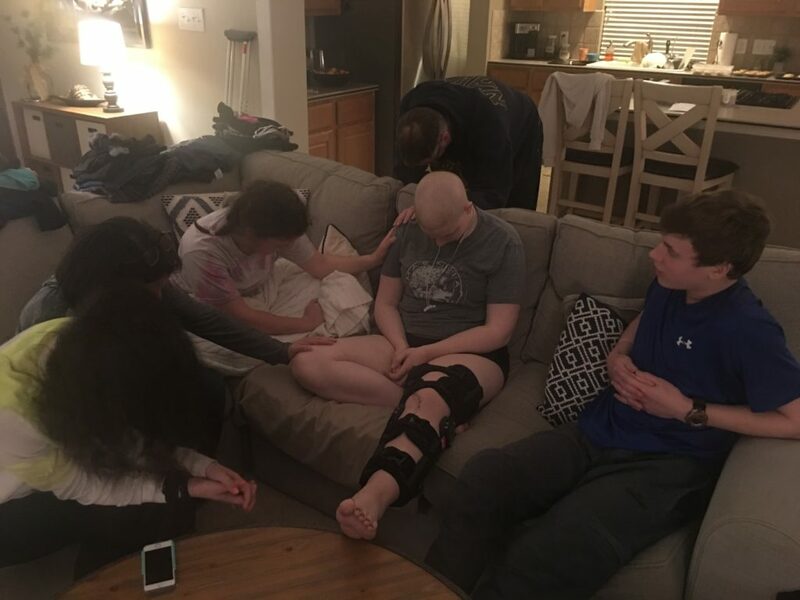 Having people pray for Emily means so much to us, and when they can pray for her while with us, it is very special. President George Bush was in the hospital recently. 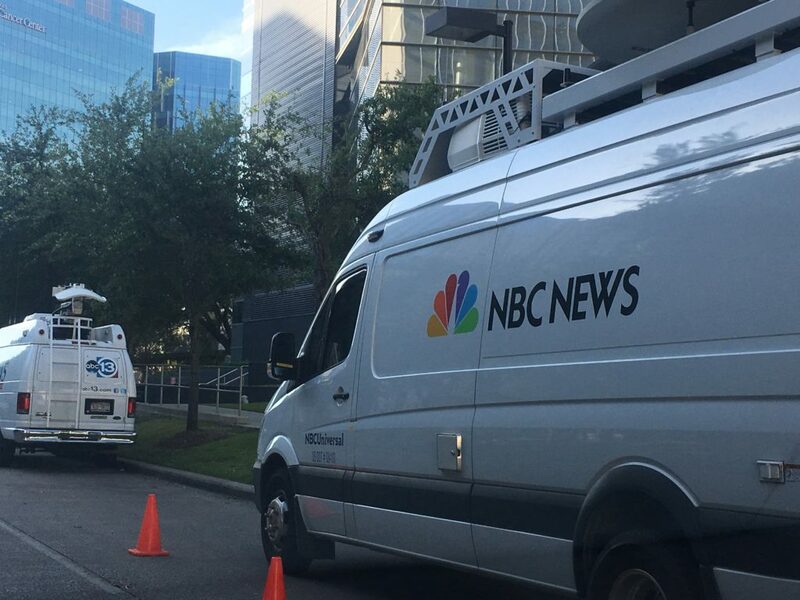 His hospital is right behind MD Anderson – so there were a lot of news trucks around for a few days. 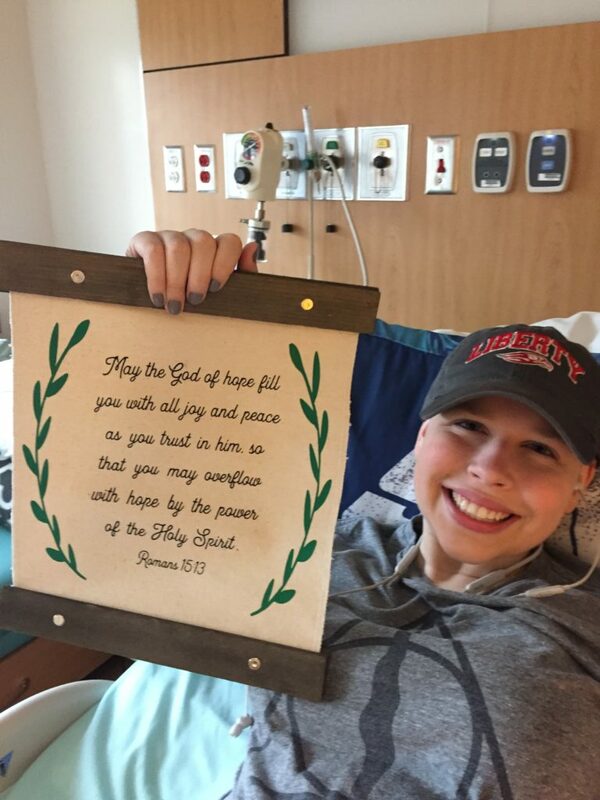 Each chemo round, I give Emily a statement or verse to focus on through the treatment. This is the verse that has been foundational through our entire process. Romans 15:13 – May the God of hope fill you will all joy and peace as you trust in him so that you may overflow with hope by the power of the Holy Spirit. This isn’t Daisy. It is Daisy’s friend, Jonesy. The point of this picture is so you can see Emily’s hair was starting to grow back. She had a lot of time from her last chemo, then a break, then surgery, then a break. And in those weeks, her hair started to grow back, but now it is falling out again as she’s had two treatments since surgery. 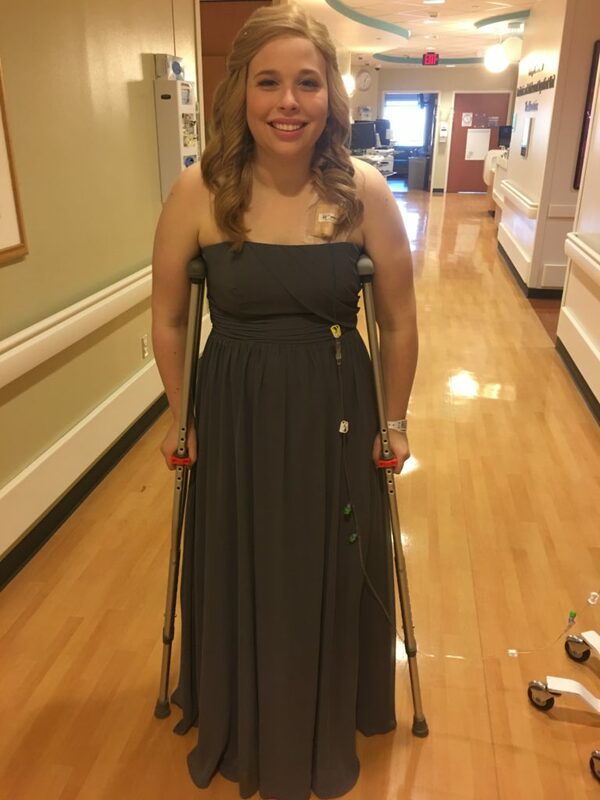 The hospital had a “prom” for the cancer patients. She felt well enough that day (it was day 3 or 4 of a methotrexate treatment), so she decided to go. Here is the “before” picture. Getting her wig hair curled. The final choice of a dress. Ready for the prom. Emily didn’t stay long. She started wearing out quickly. The prom was on the observation floor of MD Anderson. The problem was, there is only one elevator that goes all the way to the top and it broke while she was up there. 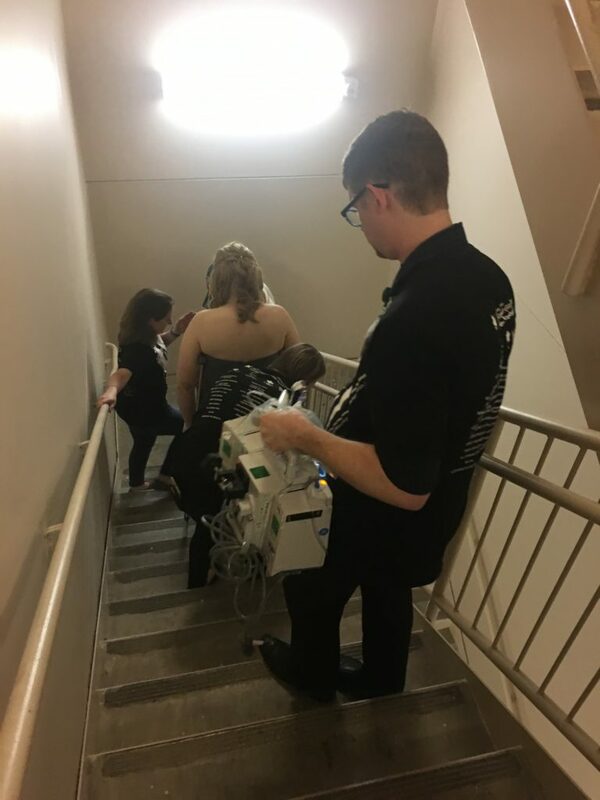 So this is a photo of Emily going down 4 flights of stairs to get back to her room. The director of the hospital was there and plenty of nurses to help get her down. This is Emily’s oncologist, Dr. Daw. We are thankful for her. When Emily made her 3 wishes to the Dear Jack Foundation, she wasn’t sure if they would grant them or not. 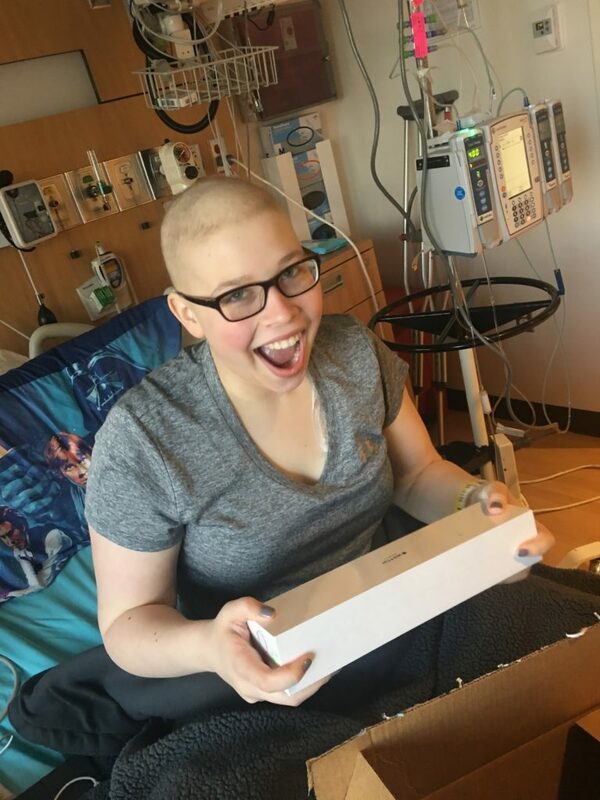 So the day she got her first wish, she was pretty excited to open her new Apple watch! Aunt Mary came for a visit to help Sue and hang with Emily. It was great to have her again. When Emily was required to go in all day to get fluids, there was a Saturday she was headed in. The problem is, the outpatient part of the pediatric cancer center isn’t open on weekends. That meant Emily would have to be in the less unfamiliar adult cancer center for her treatment. Thankfully, this nurse, Anne, volunteered to come in on Saturday and they opened an entire wing (normally closed on weekends) so Emily could get fluids in her normal surroundings. If you made it this far, thanks for your concern for Emily and especially your prayers. I will try to send an update next week after we know what is next. Praying for Emily’s appointment this week! Thank you for all the updates. Praying for wisdom in the next steps on this journey. Oh my, my, my! These may be God’s stoplights or caution lights, so wait on Him for guidance through the “not normal” routine of chemo. Maybe the meds remaining are doing extra work on the C that are not known by all the knowledge of man! I shall pray protection for her kidneys and liver and that the methotrexate will get a little extra punch in to catch any wretched hiding C cells anywhere in her body! She looked so beautiful all dressed up for her prom! And no matter what comes, that smile of hers just knocks my socks off … if I wore socks! I will Update our LCC 1:11* Servant Prayer Team with the news and road bumps, knowing that even road bumps can make us stop speeding and that our faithful Abba Father works all things together for good to them who love Him and are the called according to His purpose! Heavenly Father, thank You for Your working in this precious family of Your children! Help them have some understanding of why these bumps have been placed in their path, and help them rest in whatsoever situation comes that seems out of the normal to them and the doctors! This lovely child, Emily, is so beautiful inside and out that normal shouldn’t be part of her life but exceptional should be! Father, we trust in You with all our hearts and do not trust in our own understanding. We acknowledge You in all our ways trusting You will make our paths straight and smooth, accepting each bump in that path as from Your Hand. I know You understand their hurt and concern from Your Father’s heart, so I ask soothing, healing, strength, peace, joy, and total contentment in each soul in this family for I ask these things in the Name of Jesus Christ, our Savior and Lord, Amen! She is a remarkable and beautiful young lady. Praying for all of you. Blessings to Emily! Congratulations to Ali! Hugs to you and Sue. Hope the detour is short. Will continue to pray for strength and endurance! Thank you for the update…I was wondering!